Outsider Folk Art Gallery in Reading presents ‘Raw Edges: Jim Bloom & Purvis Young’ – bctv.org – News for Berks County and Reading, Pa: Arts & Museums. Black Friday 20% Off Sale at Outsider Folk Art Gallery! We will do our best to accommodate all orders, first come, first served. READING, PA– The Outsider Folk Art Gallery, located on the fifth floor of the Goggleworks Center for the Arts, is pleased to host a new exhibition showcasing artwork from the George and Sue Viener Collection of Folk, Self-Taught, and Visionary Art. 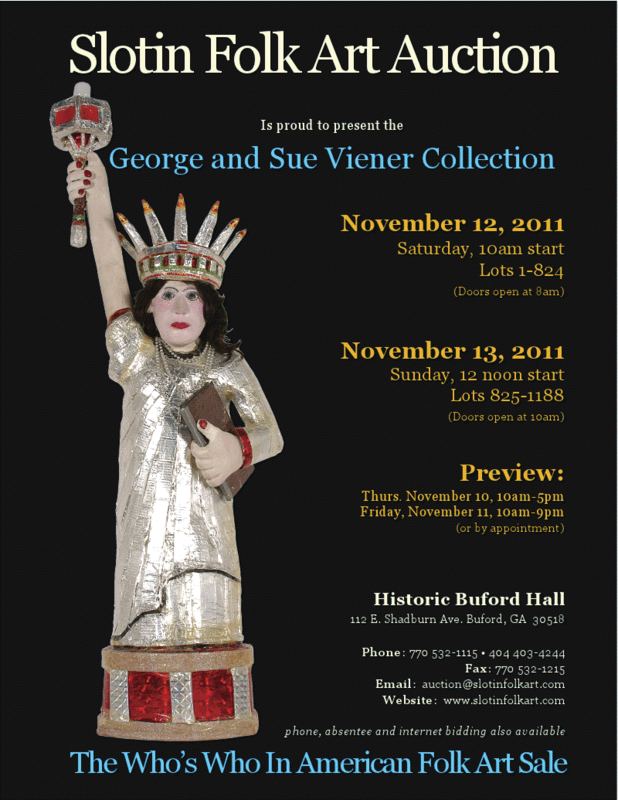 The exhibit will run from December 2, 2011 to February 17, 2012. The exhibit includes paintings, drawings, and mixed media works on wood, paper, and other materials and is curated by Emily A. Branch, Gallery Director, who joined the Outsider Folk Art Gallery in June 2011. 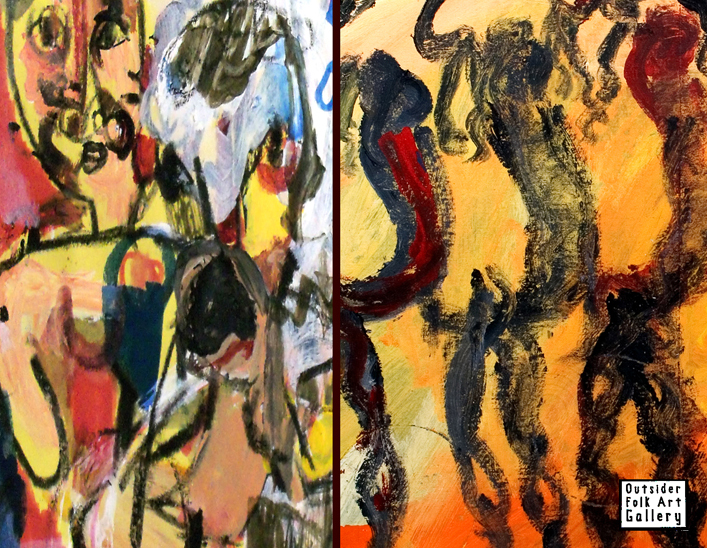 The exhibition opening will be December 2, 2011, from 5:30-7:30PM at the gallery with food and refreshments provided by Good Eatz Green Café, West Reading. The exhibit will feature work by Jim Bloom (b. 1968) and the late Purvis Young. Both Bloom and Young represent the largest holdings in the Viener collection totaling close to four-thousand active works. This exhibit parallels themes and techniques of each artist, both of whom never met, creating works that are diaries of their physical and psychological environments. Both artists also used uncommon art materials in the traditional sense, often choosing to create on whatever materials they could find or create. This exhibit has been in the thoughts of the Viener’s for many years and is now coming to fruition as the gallery is due to close in 2012. Recently each artist has had much acclaim in the world of self-taught art. Young, who died in 2010, recently had a masterpiece from the Good Bread Alley series, represented by the Viener’s, doubling the previous auction record. Bloom has been recognized by galleries and prominent collectors on the east and west coasts, which has, in turn, driven the market for his works sending values skyward. 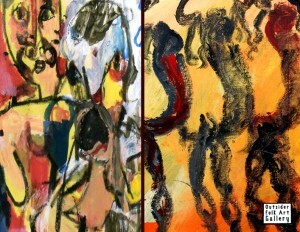 The title “Raw Edges” encompasses the personal and visual style of each artist, but also demands respect by the viewer. “I have tried to put nice frames and matting on Bloom pieces for my clients, but they exclaimed they enjoy Bloom rough and raw. It cannot be contained under glass,” said Karl Slocum, Director of Knapp Gallery, Philadelphia, PA.
Eblast! 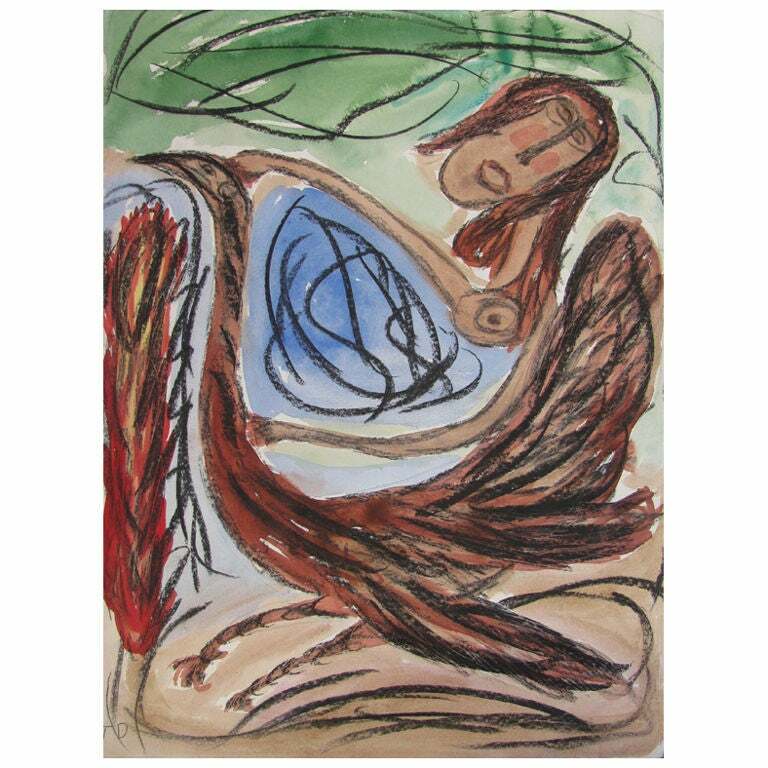 11.18.2011 | Just Posted: Thornton Dial Works on Paper on 1st Dibs | Slotin Auction Sets Record | Raw Edges Event. Last weekend at Historic Buford Hall, Buford, GA, Slotin Folk Art Auction registered a high bid of $25,000.00 for a 36” diameter painting on metal by the recently deceased artist Purvis Young. The painting was part of the collection of George & Sue Viener of Reading, Berks County, PA. The “Who’s Who of Folk Art” sale featured hundreds of pieces from the local couple, owners of the Outsider Folk Art Gallery, 5th floor, Goggleworks Center for the Arts, Reading, PA.
“I am very pleased that Purvis Young is being recognized in this manner. These masterpieces from the Good Bread Alley Series are examples of Young’s dedication to creating art that reflected his community, culture, and dreams for a better life”, according to owner George Viener. 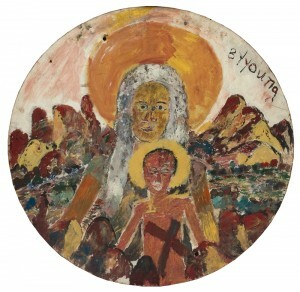 Most recently this painting, named “Mary and Jesus” was exhibited at the Cohen Gallery at the Goggleworks Center for the Arts, Reading, PA in a solo retrospective show of Young’s work spanning thirty years. The exhibit will continue to travel internationally over the next few years. The Viener’s acquired this collection and the rights to the Purvis Young documentary in 2004 and met with Mr. Young many times before his death in early 2010. There were many piece of the Slotin Auction that were at or in-line with previous auction records. Two pieces, including “Adam and Eve” by Hugo Sperger (below) were the highest recorded auction prices recorded for this artist. Accordingly, this piece by Sperger is a large example (over six feet wide!) of his skill and dedication to detail. READING, PA—Last weekend at Historic Buford Hall, Buford, GA, Slotin Folk Art Auction registered a high bid of $25,000.00 for a 36” diameter painting on metal by the recently deceased artist Purvis Young. The painting was part of the collection of George & Sue Viener of Reading, Berks County, PA. The “Who’s Who of Folk Art” sale featured hundreds of pieces from the local couple, owners of the Outsider Folk Art Gallery, 5th floor, Goggleworks Center for the Arts, Reading, PA.
Purvis Young substituted a lack of formal education with intensive reading and study and is sophisticated about the history of art. After learning of the “Freedom Walls” created by artists in Detroit and Chicago, Young decided in 1972, to create his own public mural at the intersection of Northwest Third Avenue an 14th Street in Overtown, Miami’s inner-city coined “Good Bread Alley.” The installation was visible from the newly constructed Interstate 95, which had all but dissected and consequently isolated his community from the rest of South Florida. Eventually the installation was demolished and only part of the work was reclaimed showcasing the rich history during this era. In 1970, Sue and George Viener were introduced to the world of Folk Art and Americana during their visit to the Abby Aldrich Rockefeller Museum in Williamsburg, Virginia. In 1986, they met Chuck and Jan Rosenak in Santa Fe, New Mexico, and were welcomed by them into the world of living self-taught artists. They opened the Outsider Folk Art Gallery in 2007 to showcase their ever-expanding love of art. FAX – 770 532-1215 – Faxes left after 7:00pm on Friday night prior to auction will NOT be executed. Email – auction@slotinfolkart.com - Emailed bids after 7:00pm on Friday prior to auction will NOT be executed. SOFA Chicago (the annual Sculpture Objects & Functional Art fair), along with The Intuit Show of Folk & Outsider Art, threw a chic opening night party on Thursday. The art and design world glitterati gathered for the stylish soiree, which took place at Navy Pier’s Festival Hall. Guests got a glimpse of works from the more than 60 international galleries that will be represented at this year’s expo, which is the 18th for this important, critically acclaimed exhibition. We sold numermous works by Jim Bloom, Purvis Young, John Williams, a Thornton Dial, and a large Harriet Wiseman piece. We hosted the fabulous art/light sculptures of Warren Muller and sold many of his books to astonished passersbys! Here is a picture of Warren Muller, his daughter Evan, and George at the fair. Note his sculpture at the top center of the photo! Check out more pictures from the show on our FaceBook page! Thanks to SOFA/The Art Fair Company and Intuit for being wonderful hosts and supporters for our 2011 journey!